Yes, I am a Southerner. Yes, I like grits, cornbread and a multitude of things that aren't really good for me. But, what the heck, once in awhile you just have to go for it - you won't eat this every day, right? I adapted this recipe from DamnDelicious, an amazing blog with a ton of useful links! 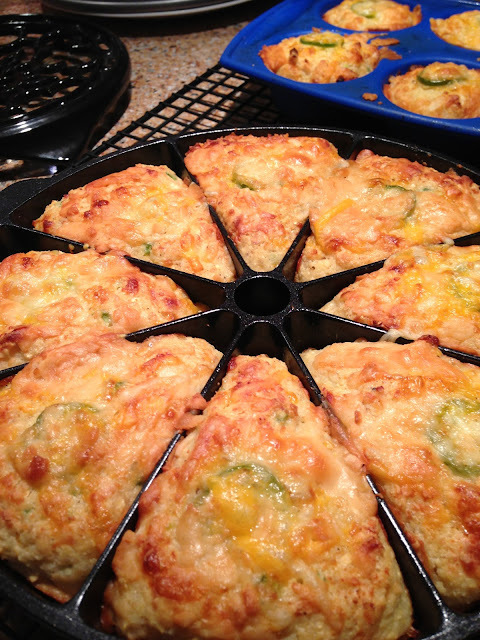 I tweaked their recipe and here is my version - more jalapenos! Instead of a muffin pan, I used a scone pan which reminds me of cornbread made in a cast iron skillet (which I will do next time for sure). I also used a 6 muffin silicone muffin pan which really works well. This recipe made 8 of the "scones" and 6 muffin sized pieces.